Originally published in 1990, Mariko Ōhara’s Hybrid Child (“Haiburiddo Chairudo”) is her first novel-length work to be translated into English. A bindup composed of two novelettes and one novella, Hybrid Child follows Yoshio Aramaki’s The Sacred Era (1978) to become the second in the University of Minnesota Press’s Parallel Futures series. This series is dedicated to publishing Japanese speculative fiction in translation which “is not content to remain within the habitual space-time divisions” of established SF, but instead uses techniques such as “temporal juxtaposition, disjunction, and multiplication” to problematize and subvert SF genre norms. For these experimentations, both Hybrid Child and The Sacred Era have won the prestigious Seiun award (the Japanese equivalent of the Hugos) for best novel, and are defined by a shared deployment of surrealist strategies of defamiliarization—via a new wave SF sensibility—which result in meditations on the nature of reality as mediated by consciousness. However, unlike The Sacred Era, central to Hybrid Child is a mother-daughter relationship which enables a more sophisticated exploration of female monstrosity and emancipation. Thus, through a sometimes meandering narrative suffused with surrealist aesthetics, fairytale tropes, and graphic violence, Hybrid Child explores the collision of militaristic and maternal forms of control, alongside their resistance through hybridity. Having seen the end of another Women in Translation month (#WITMonth), I would like to take a moment here in which to underscore the importance of seeing more Japanese female writers being translated. There is no dearth of Japanese women writing speculative fiction; however, with the exception of Kaoru Kurimoto, Sayuri Ueda, and Miyuki Miyabe, few novel-length works have thus far been translated into English. Mariko Ōhara now joins these few, having previously had only three short stories translated into English (namely “The Mental Female,” “Girl,” and “The Whale that Sang on the Milky Way Network”). Jodie Beck’s translation of Hybrid Child is flowing but precise, and deftly manages to maintain Ōhara’s formal experimentations and hypertextual plot leaps, whilst conveying Ōhara’s fusions of the beautiful and the grotesque with aplomb. 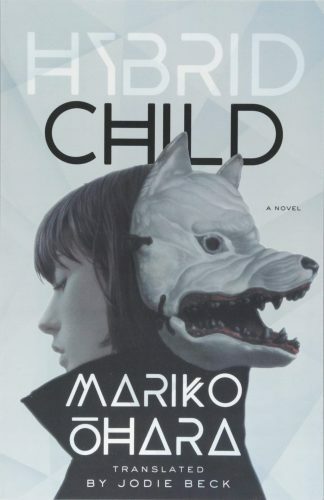 Let me front-load my review by stating that Hybrid Child is a pretty wild book—with a narrative sliding between the multiple POVs of a motley lineup of characters. It’s far beyond the scope of this review to cover all these narrative strands (and I will be focusing on the central story arc) but here’s a brief list of some the novel’s costars for your delectation: a Military Priest and quasi-divine leader who is aging backwards (Benjamin Button-style) and often becomes unmoored in time; Shiverer Mouse, a human suffering from a degenerative disease and encased within a technological coffin which ironically keeps him alive; a dead mother resurrected in the form of an extinct interstellar life-form known as a “dragon cosmos”; and a genuinely repellant mob boss who indulges in the most heinous acts of mutilation and murder. Still with me? I could go on with outlining Hybrid Child’s carnivalesque cast but I think I’ve made my point: when it comes to this text, surreal is sometimes an understatement. Consider yourself warned. I particularly appreciated these brief experiential vignettes of interspecies understanding (and I greedily would have liked more). These glimpses into genetically engineered creatures’ experiences of containment and freedom parallel, and are immediately tied to, the struggles against enclosure faced by all of the text’s characters. Sample B#3’s transformations allow for peeks into contrasting aspects of reality as experienced by other forms of being, helping to problematize any notion of a single stable reality. (As you may have already guessed, Hybrid Child has a very malleable understanding of what qualifies as real.) The role of hybridity in the text does have its limits, however, and it is important to underscore that emphasis is placed on Sample B#3’s metamorphoses as simulations. This tension, between becoming and simulating forms of nonhuman life, can be found throughout the history of SF. Unlike the rest of his group, who remain passive, seemingly without will, need, or desire (and thus the exemplary military tools), Sample B#3 breaks with the reality he has been ascribed, through escaping the military complex in the form of a human technician. His escape signifies the evasion of control enabled by hybridity—since Sample B#3 uses mimicry to evade and subvert, rather than further, military agendas. This flight from constraint enables Sample B#3 to exercise free will, as obtained through the transgression of military order and (as we will see) maternalistic forms of care. Concordant with the novel as grotesque fairytale, it is whilst in his fabulated Dadazim form that Sample B#3 finds, and is invited into, the secluded house of a writer known only as “Mama.” This house is overseen by an AI “housekeeper” program which is a computational iteration of Mama’s dead daughter, Jonah. Mama, who continues to imprison and terrorise her daughter’s AI avatar, is often characterised as a forgetful tyrant. Hence, whereas Sample B#3’s recovering of memories through sampling leads to greater understanding of other beings’ lifeworlds, here the act of forgetting results in derangement, violence, and a thirst for control. The novel’s perennial sense of containment is literalised through Mama’s house, which serves as both a site of madness and death as well as a means of protection and passage. As a “housekeeper” AI, Jonah is responsible for maintaining the conditions of her house/prison, whilst also serving as the de facto caregiver for her own mother. In other words, Jonah as child/AI remains under her mother’s control whilst simultaneously becoming her mother’s mother. The structural pattern of Hybrid Child is based on the return and replication of trauma, as “when memories of oppression start to come out, the things that one has experienced are perfectly replicated in reverse” (p. 239). This pattern is performed through the circling relations between characters, where care and control are often inverted and wielded by those formerly enchained by them. Modes of control are therefore not statically assigned. Instead, depictions of power and control throughout the text remain plastic, rendering each character both subjugated and subjugator at different times. This cycle of trauma and control depicts power dynamics as messily attributed, rather than discreetly maintained, enabling the text to take on a more nimble negotiation of how methods of control are enacted. Although I understand its usage on a formal level, then, I found that this obsessive circling around the same mother-daughter power dynamic created a plot based upon extensive repetition, which became a bit tiresome—doubly so as motifs of birth and consumption are perhaps too heavily applied throughout and can thus seem overwrought. I can forgive this repetition, though, as Ōhara’s relentless experimentation did keep me engaged (admittedly sometimes with toes curled) throughout. The mother-daughter relationship is further reproduced when the narrative moves to the planet of Caritas. Caritas, the Christian notion of love for all things, is another notion of care which is undercut by the planet being “one of the fiercest battlegrounds in the war” (p. 253), a subversion of care which is further satirised by a demented AI named Milagros. Milagros was originally programmed to be a maternal caregiver networked throughout Caritasian society. Due to war-induced neurosis, however, Milagros has become forgetful and deranged, leading to the gradual extermination of the population under her control. The destruction which was wrought by Mama’s forgetfulness is now ratcheted up through Milagros to the level of society at large, leading to the planetary decline of Caritas. Love thus sometimes plays a regenerative role within the text. Genuine care becomes a catalyst for the willing surrender to a melding with another, and as such becomes the novel’s ultimate form of hybridity. This form of love gestures towards the need to build more egalitarian emotional frameworks in order to improve the body politic, and helps the novel reach a denouement beyond the endless replication of capturer and captured, leading to a final, ambiguous but total, unification. So, how did I feel after finishing this complex novel? On the whole I found it an intriguing work which has helped to further expand my expectations of what SF can do. The standout section of the work for me remains the first novella, which has the greatest aesthetic cohesion and tightest plotting. If you are interested in strange texts which experiment with the limits of SF as a genre, and don’t mind a lot of graphic violence, then this could be the fiction for you. Rachel Hill has previously written reviews for Foundation, Shoreline of Infinity and Femspec. Originally from North East England, she now lives in London. Interests include science fiction (the weirder the better), science and technology studies, and cross-stitch.